The Service Pavilion first started out late summer of 2001 as the Arai Helmets Service Pavilion. The idea was brought to life by Robert through many experiences working with Arai helmet owners, racers and potential customers over the phone at the Arai office, at race events and anywhere else riders were! The first time the pavilion was unveiled was at the 2001 AMA Superbike Road Race in Alton, VA at the Virginia International Raceway (VIR). (See photo above.) The reception was tremendous! The fans and consumers of Arai products were in amazement. It was a very successful weekend for everyone. Specialty fitting, technical services, warranties addressed, questions answered, very rare Arai apparel for sale, and even some great autograph sessions from Eric Bostrom, Tommy, Nicky, Roger Hayden and Jake Zemke just to name a few. Well with that huge success, the decision back at Arai HQ was to continue this service on the road over the winter at the Cycle World International Motorcycle Shows Tour which traveled all over the USA. The momentum just continued to build. At the end of the tour during the 2002 Bike Week in Daytona Beach, FL, the decision to take it on the road to the AMA Superbike Series was made. This led to more success in ways no one had expected. By the end of the 2002 racing season Robert had some job offers to move elsewhere in the industry. But he also had shown signs of wanting to go independent and possibly carry on the “pavilion torch” on his own. And the decision was made. “The Service Pavilion” was made its own entity from Arai Helmet Americas. Everyone at Arai was in full support of the move. It was the best for everyone in every possible scenario. So on October 1st, 2002 THE SERVICE PAVILION was born! -Here is a side story from Robert on things before 2001 and the creation of The Service Pavilion. 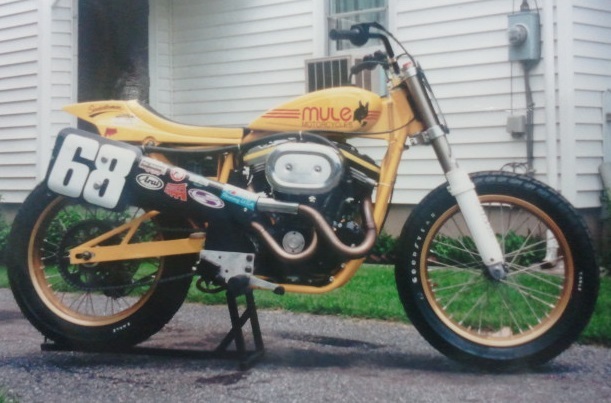 I had spent 99% of the 1990’s working on and racing motorcycles professionally in the flat track genre. Trying to build my own professional career in racing with the support and help of my family and close group of friends in the motorcycling community. I had many successes and gains. I had some set-backs and losses. But would do it exactly the same way I think again. There is nothing I regret or question that I can think of at the moment. Well I guess we’ll start this off by taking you back to Fall of 2000. 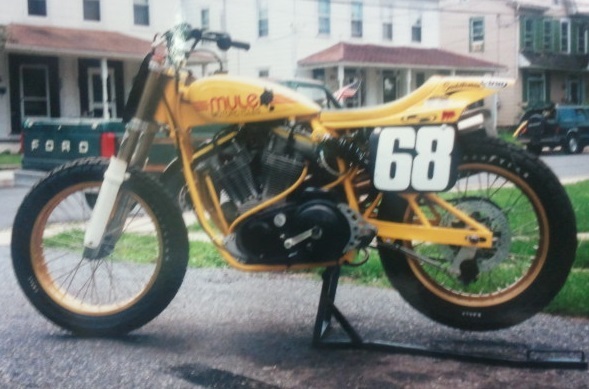 I was still racing professionally in the Grand National Flat Track Championship. I was in Portland, Oregon racing at Portland Speedway ½ mile on a brand new bike in a series then called “SuperTrackers”. The new chassis was built by Richard Pollock from Poway, CA of MULE Motorcycle. –Check out www.mulemotorcycles.net to see his work! (See photos of the bike at the end of this article.) With a 1000cc Harley Davidson engine that the late Tim Russell and a few others had been helping us develop, I was having a really good day on the track. The new bike was working really well, the lap times were fast! But late in the one practice session I was involved in a bad crash from what I was told. I do not recall a lot of that situation. But here is an interesting detail. Jim Duffner of Trident Films had spoken to me about wearing a helmet cam for the race event. I said sure! Here is a YouTube link to that footage. Every time I watch it, I seem to pull a little more detail of where things are. If you watch the video, at about the 2:50 minute mark the crash begins. Nothing spectacular I say from the view, but the mess that happens afterwards is the interesting stuff. That was a day I'll always remember, and glad I do in many ways! Lonnie Kopp’s engine locked up coming off turn 4 in practice. That’s why you see his bike’s rear end sliding in front of me in the video. The radar gun showed a 97 MPH impact speed when I hit him. We were down and at that point I was out cold. Told from there 3 other riders ran into the bikes, bodies & parts flying everywhere. At the 3:00 minute mark on the video it goes to an infield camera view. The body you initially see in yellow and red leathers is me laying there. The camera pans up the straight away and you see people going to two other peoples bodies. Bikes were laying everywhere. But no one was really attending to me. Some other people there (Chris Carr and his crew of Kenny Tolbert and Travis Smith) have told me many times they thought I was" gone" already. With so many in the crash, track crew and emergency staff were going to the riders that were moving. They thought by the way my head and legs were twisted and turned, not much was going on with me. What some people tell me now, it seemed like an eternity that no one was checking on me, but then I started moving and it surprised and even scared some of the emergency people. Not sure about Eli Price and Troy Rose's exact injuries, but I ended up with a pretty bad concussion. I remember waking up to someone telling me "Stay still." I said "OK". Then I remember going asleep again, (at least I felt like I did), then woke up to the guy telling my leg is broken. I said "OK" and thought to myself that's not too bad. I know I had some head injuries. Been there before! Went to sleep again and woke up to the guy telling me "Your leg’s not broken but your leg is 4 inches shorter than your other one." I thought to myself, ok! That's not real bad, at least my legs not broke. Once in the hospital I learned my knee was torn apart. Tib and fib were up beside my femur! Only thing not torn was my main artery and the main nerve through the leg was partially torn. What can be gathered from the evidence from the accident is, I was laying on the track unconscious and a front wheel ran into the side of my knee. The leather kept my leg attached, but tore the knee apart from the impact and forced everything below the knee joint up beside my femur. Well in a nutshell, spent a week in the hospital in Oregon. Then I was flown home to PA. Then had my knee rebuilt. I spent the next 12 months in therapy and rehabilitation. I wish I would have broken my leg! From that weekend all 6 of the riders survived the crash but 3 of us never made a return to professional dirt track racing, myself included. 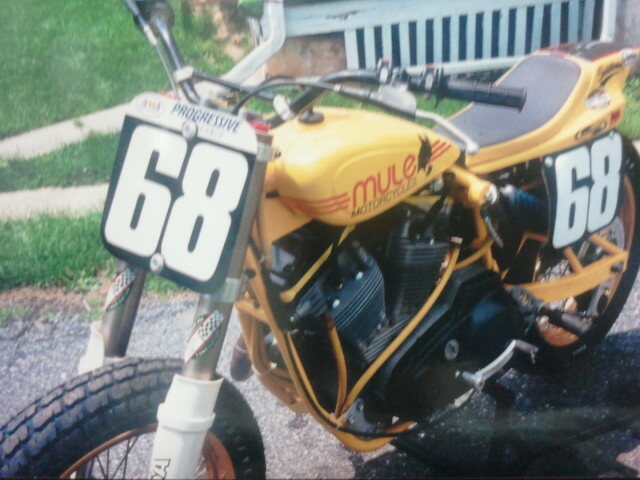 The rest is history...now just riding and racing for fun!!! Jump to sometime after the accident in the fall of 2000. I was just about to take job that I was offered at Howell’s Harley Davidson in New Kingstown, PA. Jim and Gwen Howell had been a big part of my professional racing career through the 90’s and are like family to me to this very day. Just as I was about to take that job, I got a phone call from Brian Weston (Director) of Arai Helmets Americas. All said and done, I went to work for Arai. So over the next year and half I was led over a very steep learning curve experiencing the many facets of what goes on within a company such as Arai. I was brought in as a technical and racing service representative. What I learned and experienced was amazing. Learning from Brian with his almost 20 years of working around Arai helmets at that time with his father Roger Weston and Bruce Porter was priceless. And also his continuous developments with Arai Helmet Japan in the product and consumer support was something I could never learn any other way, then getting to watch and listen to Brian. Looking back on that all was a truly awesome experience! So October 2002 is when The Service Pavilion was born. Over the next 12 years Robert would take TSP to as many events in a year’s time that was possible. In the busiest years TSP was at 32 events a year! Through multiple trucks, transmissions, trailers, tires, thousands of gallons of gasoline and thousands of gallons of diesel fuel used to travel all over the country. With fifty-thousand plus miles driven some of those years! Robert just tracked his full one-way drives across the country, coast to coast. As of the summer of 2013 Robert has driven 98 times across the U.S. Taking the display and bringing TSP's service of Arai helmets to as many people as possible. Over the past 12 years Mark, Moon, Ed, Kareem, Jeanie, Kerry, Heather Vegas, Heather Colorado, Jenh & Arai, Paul, Crystal, Todd, Mike (Master Bates), Sloth, Sammy, Sterling, Kurt, Sponseller, Kayla, Emma, Kate, Jess, Tim, Jen Joe, Dennis (Robert’s Father) and Brianna (Whom is now Robert’s Wife!) have all been a part of TSP working. All of the people we have sold helmets to have made this work. All of the people we helped by fixing their helmets made this work. All of the people we taught a little something about helmets and fit to them made this work. The 23,000+ people TSP have fit for Arai helmets made this work. As of late 2014 over 10,000 Arai helmets have been sold by TSP since 2002 have make this work!